It's National Multicultural Festival week in the capital, "Multi Culti" as it is affectionately known by the locals. With that in mind, I have a renewed sense of food adventure and a keenness to celebrate the many cultures that have contributed to Australia's diversity. Rama's Fijian Indian is tucked into the Pearce shops – the restaurant is a Canberra institution in itself, having been here for more than 25 years. It's bustling and almost completely full when we arrive on Wednesday night, it's just as well my partner had the forethought to make a booking. Walking into Rama's feels a little like walking into a friend's house for dinner. We're greeted at the door by a lady that calls my partner by name, despite us never having been here before. Mini knows everyone in this restaurant, whether it's your first time or your hundredth; she runs the floor with a vivaciousness and friendliness that seems to come naturally to her. There's no charge for corkage here either – another little touch that makes it feel like we've almost been invited to dinner. There's plenty of choice for vegetarians and vegans, which makes it a great group dining option for varied dietary requirements. The banquet options look like good value starting at $35 a person for dinner. Complimentary pappadums land on the table shortly after our order is taken, I notice almost every table has some. They're crisp and light, served with a bit of raita on the side. The mixed entrée - vegetable samosa, fish pakora and bhajia ($28) are a good foray into diaspora cuisine, familiar but subtly different in their execution. The pastry of the samosa is delightfully crisp and holds together tiny cubes of diced potato and plump peas. Fish pakora and bhajia are good too, piping hot and served with a tamarind dipping sauce. 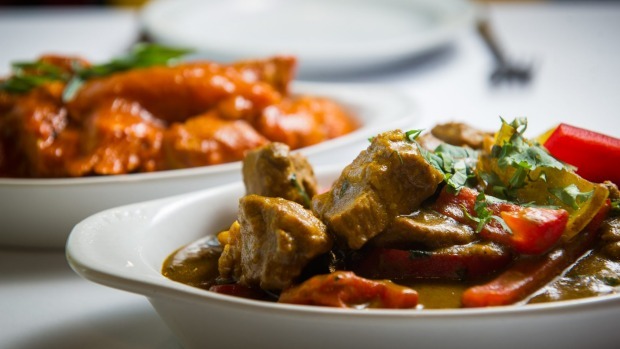 The curries are cooked to order with the level of spice tailored to your heat tolerance. Mini starts us on medium and I optimistically choose medium-hot for the mango chicken. As it turns out, Fijians have a taste for spice and medium is plenty hot – even for someone of Indian heritage like me. As I've since learnt, approximately 40 per cent of Fijians are of Indian descent. 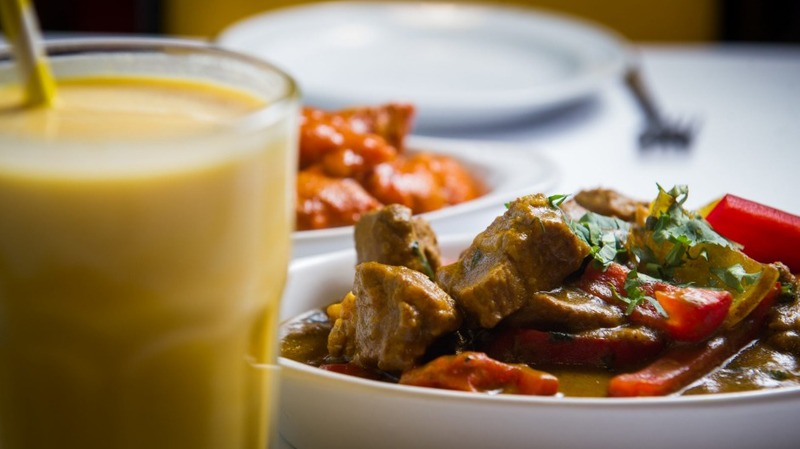 Their cuisine is strongly influenced by the southern part of the subcontinent, but they don't shy away from beef and tend to use coconut milk rather than cream to lighten their curries. Jhinga Nariel prawn curry ($27) is my favourite curry of the night. Fresh prawns cooked in a tomato and coriander curry, it has all the depth and simplicity that comes in a home-cooked curry. Slivers of red chilli and shreds of fresh coriander leaf are visible through the curry. I love that you see how it's been cooked. It's authentic, home-style and comforting; all elements in harmony and the hand of an experienced cook is evident. Fijian pork curry ($26), another of its signature dishes, doesn't disappoint either. The pork is tender and the curry well-balanced. 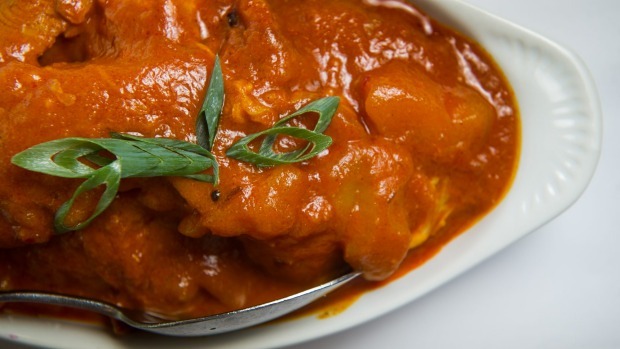 Aamm or mango chicken ($25) is a curry of boneless chicken pieces and mango wedges – slightly sweet and fiery hot. We eat these curries with garlic paratha ($2.90), white rice ($3) and a side of cucumber raita ($5) to help temper the heat. Mango lassi ($4) is a bit too sweet for my taste. The ever-watchful Mini notices that I haven't had much of it and offers me more yoghurt to balance it out, but I'm pretty full by this point. It's unheard of, but I can't even contemplate dessert. There are lots of leftovers and they're quickly packed up into containers for us to take home; I notice that many other tables have takeaway too – the portions are certainly generous here. The difference between a cheap and cheerful and home-style dining experience is the service, and that is here in spades at Rama's. It feels more like a heartfelt hospitality here at Rama's though – diners linger at the counter chatting to Mini while paying their bill. They tell her of their holiday plans, where they're going and when they will be back to eat here. She knows everyone's story and takes the time to walk everyone to the door, just like you would at a good friend's house. Rama's Fijian Indian is tucked into the Pearce shops and is a Canberra institution in itself.